Reading and share top 25 famous quotes and sayings about Yesterday Today And Tomorrow by famous authors and people. Browse top 25 famous quotes and sayings about Yesterday Today And Tomorrow by most favorite authors. 1. "Once Ptolemy and Plato, yesterday Newton, today Einstein, and tomorrow new faiths, new beliefs, and new dimensions." 2. "Families are the tie that reminds us of yesterday, provide strength and support today, and give us hope for tomorrow. No government, no matter how well-intentioned, or well-managed, can provide what our families provide." 3. "For the yesterdays and todays, and the tomorrows I can hardly wait for - Thank you." 4. "It could be yesterdaywhen I was less in loveI thinkFor I didn't see you in the mirrorbehind mewhile getting dressed.The way your hands couldn't stay awayand our bodies always found their ways back to each otheras if they were meant to be togetherClose.But then it was today and I saw you againin the mirrorbehind me while getting dressedSo I go to sleep tonightalonewithout actually falling asleep because I'm scared of the moment I will wake upand realise it was just a dreamYou're actually gone.Now all I can do is get through to another tomorrowhoping that I will be less in loveagainLike yesterdayBut not today.I was never really well with things at all." 5. "Any thoughtful physicist, he said, well schooled in quantum mechanics, would agree that all time exists simultaneously, which I subsequently learned was the case. In truth, Father said, as the first instant of the universe, all of time was present, all our yesterdays and today and all our tomorrows, everyone and everything that was and ever would be existed at that moment." 6. "The perfect of yesterday / today, may not last till tomorrow.And for not being perfect yesterday / today, doesn't mean that tomorrow will be the same." 7. "Ignorance is never out of style. 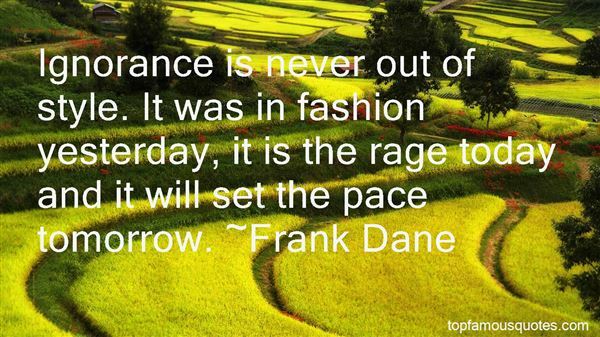 It was in fashion yesterday, it is the rage today and it will set the pace tomorrow." 8. "Only God is the same yesterday, today and tomorrow. The Church has always been changing." 9. "My days were not days of the week, bearing the stamp of any heathen deity, nor were they minced into hours and fretted by the ticking of a clock; for I lived like the Puri Indians, of whom it is said that "for yesterday, today, and tomorrow they have only one word, and they express the variety of meaning by pointing backward for yesterday forward for tomorrow, and overhead for the passing day." This was sheer idleness to my fellow-townsmen, no doubt; but if the birds and flowers had tried me by their standard, I should not have been found wanting." 10. "Be not anxious;yesterday is your experience, today is your experiment and tomorrow is your expectation. Maximize the time!" 11. "The soft bonds of love are indifferent to life and death. They hold through time so that yesterday's love is part of today's and the confidence in tomorrow's love is also part of today's. And when one dies, the memory lives in the other, and is warm and breathing. And when both die — I almost believe, rationalist though I am — that somewhere it remains, indestructible and eternal, enriching all of the universe by the mere fact that once it existed." 12. "When Yesterday, Today, and Tomorrow meet, only Today gets to shake hands twice. That makes Today twice as important as the other two. But it also means that Today must be careful, because who knows whether Yesterday or Tomorrow washed their hands after going to the bathroom." 13. "After all, how many of our todays and of our tomorrows do we want to give our yesterdays? It is one thing to be victimized by another. It is quite another to victimize ourselves because we cannot learn from the past or forgive. Those who choose to live in the past, to live in the land of regret and complaint, do so at the sacrifice of their todays and their tomorrows." 14. "Yet the timeless in you is aware of life's timelessness, And knows that yesterday is but today's memory and tomorrow is today's dream. And that that which sings and contemplates in you is still dwelling within the bounds of that first moment which scattered the stars into space. Who among you does not feel that his power to love is boundless? And yet who does not feel that very love, though boundless, encompassed within the centre of his being, and moving not from love thought to love thought, nor from love deeds to other love deeds? And is not time even as love is, undivided and paceless?" 15. "Yesterday is but a dream,Tomorrow is only a vision. But today well lived makes every yesterday a dream of happiness, and every tomorrow a vision of hope." 16. "Do you think love just goes away? Pops out of existence when it becomes too painful or inconvenient, as if you never felt it? "I looked at him. What did Jericho Barrons know of love? "If only it did. If only it could be turned off. It's not a faucet. Love's a bloody river with level-five rapids. Only a catastrophic act of nature or a dam has any chance of stopping it—and then usually only succeeds in diverting it. Both measures are extreme and change the terrain so much you end up wondering why you bothered. No landmarks to gauge your position when it's done. Only way to survive is to devise new ways to map out life. You loved her yesterday, you love her today. And she did something that devastates you. You'll love her tomorrow." 17. "Yesterday is but today's memory, and tomorrow is today's dream." 18. "Never regret yesterday. Life is in you today and you make your tomorrow." 19. "No name. No memory today of yesterday's name; of today's name, tomorrow. If the name is the thing; if a name in us is the concept of every thing placed outside of us; and without a name you don't have the concept, and the thing remains in us as if blind, indistinct and undefined: well then, let each carve this name that I bore among men, a funeral epigraph, on the brow of that image in which I appeared to him, and then leave it in peace, and let there be no more talk about it. It is fitting for the dead. For those who have concluded. I am alive and I do not conclude. Life does not conclude. And life knows nothing of names. This tree, tremulous pulse of new leaves. I am this tree. Tree, cloud; tomorrow book or wind: the book I read, the wind I drink. All outside, wandering." 20. "The early pioneers of both wellness and network marketing were motivated by the sense that it was possible to create a better life than the conventional routes offered - better personal health and better economic health, respectively. Now the 'alternatives' of yesterday have become the economic powerhouses of today and tomorrow." 21. "[J]ust as in the sciences we have learned that we are too ignorant to safely pronounce anything impossible, so for the individual, since we cannot know just what are his limitations, we can hardly say with certainty that anything is necessarily within or beyond his grasp. Each must remember that no one can predict to what heights of wealth, fame, or usefulness he may rise until he has honestly endeavored, and he should derive courage from the fact that all sciences have been, at some time, in the same condition as he, and that it has often proved true that the dream of yesterday is the hope of today and the reality of tomorrow." 22. "Today I realized that what I wrote yesterday I really wrote today: everything from December 31 I wrote on January 1, i.e. today, and what I wrote on December 30 I wrote on the 31st, i.e. yesterday. What I write today I'm really writing tomorrow, which for me will be today and yesterday, and also, in some sense, tomorrow: an invisible day. But enough of that." 23. "I was smiling yesterday,I am smiling today and I will smile tomorrow.Simply because life is too short to cry for anything." 24. "It has taken many years for the game of go to initiate me into the freedom of slipping between yesterday, today, and tomorrow. From one stone to the next, from black to white, the thousands of stones have ended up building a bridge far into the infinite expanse of China." 25. "In the end, today is forever, yesterday is still today, and tomorrow is already today." I am just your everyday, average girl. I live by the beach. I wear flip flops. I don't wear make-up. I go to the gym."